We at MPH Specialties are proud to work on your car. We gain satisfaction by repairing your car correctly, and can effectively tackle and solve the most challenging problems. Our advertising is limited to word of mouth and we take great pride in the details that lead to great performance. We use the power of knowledge to repair the most challenging problems. If we didn't do good work, we wouldn't be in business for long. It is not uncommon for customers to call MPH Specialties to repair work attempted by another shop, causing stress and dissatisfaction. It is a challenge for us to take the job on, to exceed the customers satisfaction, and to repair the car correctly by MPH Specialties. We are humbled when people call from as far away as San Francisco or Seattle to schedule an appointment. Today's new cars are loaded with computers and electronic features that work great until something goes awry. MPH Specialties stays current on today’s and future automobile technology and is aware of common glitches many older independent repair shops won’t choose to handle. Our mission is to deliver economy, reliability, and customer satisfaction through our work. MPH Specialties is an environmentally aware auto repair facility. Every car is assessed for environmental efficiency and system checks. Tire pressure, engine state of tune, and safety checks are standard on each car. It is this attention to detail on which our reputation is based. MPH Specialties buys "Blue Sky" renewable power for shop electrical needs. All used parts and fluids are disposed of responsibly. Waste engine oil, transmission fluid, and brake fluids are used for shop heat, and, all scrap metal, cardboard, and paper are recycled. MPH Specialties was established in 1994 in a single car garage in North Portland. The founder, Mark Hatten, has an automotive technical degree from Chemeketa Community College. Mark is an ASE master certified technician in all aspects of mechanical automotive repair. 21 years of experience is now behind MPH Specialties. 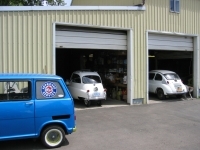 MPH Specialties has a soft spot for microcars and orphan cars. Most of these older cars fit a need from the past, and uphold a minimal but reliable mode of transportation. The world’s resources are precious and automobile efficiency is a main concern. We have extensive experience in Subaru 360 sedans, Subaru 360 vans, Messerschmitt KR 200s, Honda 600s, Ramblers, and other rare small cars. N.E. Portland near the Portland International Airport. Specific car light fabrication such as race car safety systems. 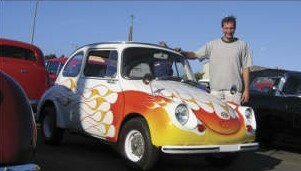 MPH Specialites is the proud sponsor of the annual Great Pacific NW Mini-microcar meet held every summer in Portland, Oregon.